NISC is delighted to announce the launch of our newly developed website featuring a fresh look and feel, improved functionality and our new branding. The new, clean-looking platform will enhance the user's experience, by offering simple, quick, intuitive navigation. Our journals, books and database pages feature improved usability and we have added new pages on the site to service different kinds of users, wanting to discover more about NISC and our service offerings. The new site has a dynamic news page, featuring items relating to changes at NISC, new products, promotions, prominent research and other useful updates. We have also added links to our pages on several social media platforms, which will be updated regularly. Plans for a new site have been in the works for some time and we are pleased that we have reached the stage where it is able to go online. Thanks must go to our developers at Eiledon Solutions who have worked tirelessly to ensure that the new site met all of our technical and design specifications. 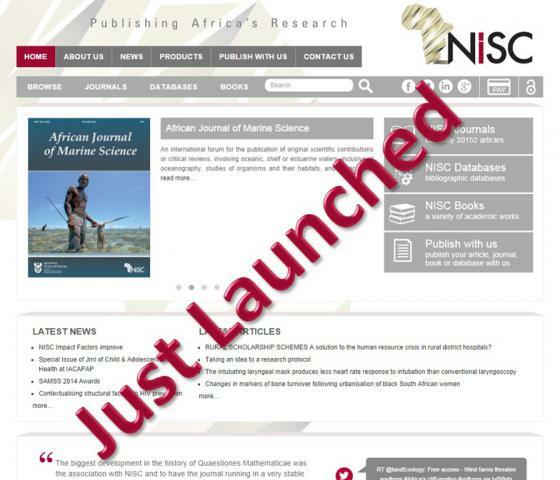 We will be adding finishing touches to the site in the coming months, but we know this new website will provide users with an improved experience as NISC continues to bring Africa’s research to the world.